Edgard de Souza, Tigelinha (Grupo I) (Small Earthen Bowl [Group I]), 2004, cow skin, 23 5/8 x 10 1/4 x 4". The late artist Mira Schendel, a Brazilian transplant, was one of the few who bridged the gap between the Concrete and Neo-concrete groups in the 1960s. This divide was as generational and geographic as it was formal: While the former movement defined geometric sculpture and painting in modernist São Paulo, the latter pushed for experimentation in color, form, and tactility in unevenly developed Rio de Janeiro. Schendel’s interest in poetry and sparse graphic forms tied her to Concretism, just as her manipulation of paper aligned her with Neo-concretism. In this exhibition, curator Fernanda Arruda gathers the work of three contemporary São Paulo artists (Edgard de Souza, Marcius Galan, and Camila Sposati) around four of Schendel’s monotypes, made from marks transferred from inked glass onto rice paper. Suspended in Plexiglas and hung at the front of the gallery, Schendel’s untitled series dates from 1964, the first year she constructed sculptures from the rice paper on which she had been printing and drawing. These images resemble her rolled and knotted bits of paper, and they prefigure a looser conception of Brazilian sculpture, as seen in the works by the trio of São Paulo artists. Three of de Souza’s sculptures, made of molded black leather over wood, appear like stealth amoebae scattering over a fluid surface. 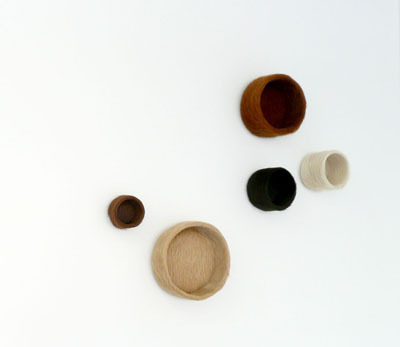 Across the gallery, in de Souza’s Tigelinha (Grupo I) (Small Earthen Bowl [Group I]), 2004, five circular receptacles made from cowhide summon their material’s animal origins while creating a dialogue about order. In between de Souza’s sculptures, Galan’s Isolante (quadrado) (Insulated [square]), 2006, a metal quadrilateral, draws from both sides of Brazil’s conceptualism/abstraction divide. Though seemingly a standard primary-colored geometric frame, the work is skewed: Its top edge is flush against the wall, but its bottom rests on the ground closer to the center of the room, so that the form’s mass tips as if jauntily propped. Its orientation suggests human movement and, with it, human frailty. It’s a complicated material experiment, simplified visually by its color and placement. If the piece is Galan’s metaphoric answer to what would follow Concretism and Neo-concretism, it is well suited to a place alongside the art of Schendel, who posed the question.